How has agility evolved into what we see most weekends? How has it gone from flowing straight forward courses to some fairly technical challenging courses? When I started agility in July 2004, I remember thinking wow this is hard. Now I look back on it and say – wow…those are easy! I’ll admit I haven’t been in the sport as long as some, but I seen changes over the past 9 years. Now, what are we looking for when we go to a local agility trial on any given weekend? Hopefully, the most important is to have fun with our dog. After that, everybody’s reason may be different. To get just get a Q, to finish a title, to qualify for nationals or regionals, to be challenged, to hang out with friends…the possibilities are endless. But whatever the reasons, I have to say I love the days when I get to a show and see something challenging. A backside, a pull through, a threadle, long fast lines with something very technical at the other end. I know I can’t always make it through it, but I LOVE trying. Not everyone agrees with me, those that just need a Q for something, probably would prefer not to have such a technical challenge. But I think this is the fun of agility, you never know what you may face when you get up on the weekend and got to the show. Recently at the SW USDAA Regional, I entered the Masters Challenge classes. What fun! It was getting late in the day, so they added another little twist – if you E’d (went off course), you were asked to leave the course. Just to keep things moving. That little twist, was a lot of fun. Not only were the courses challenging, but you had to stay on course or you didn’t get to finish! 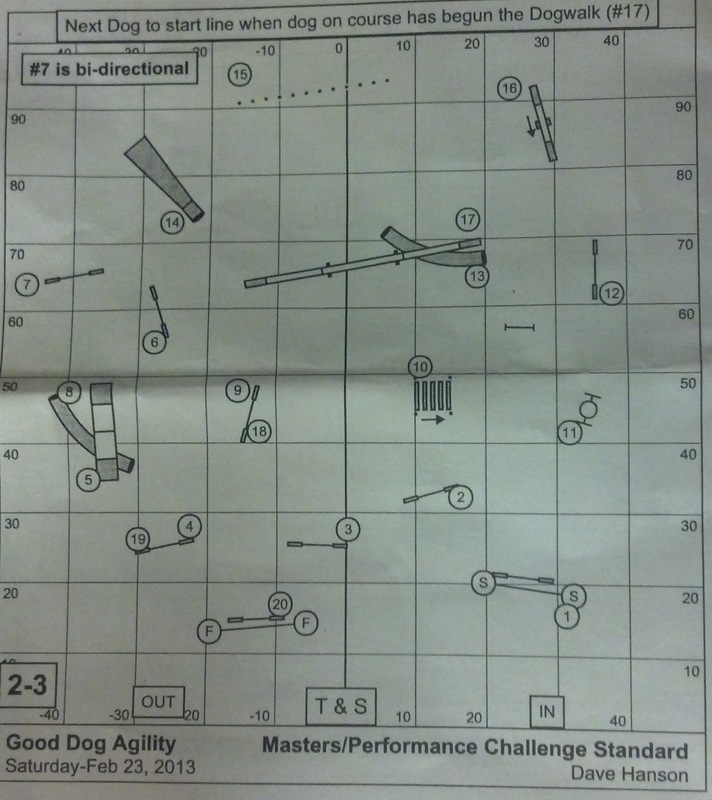 I made it through the Standard course, but when I tried jumpers a bit later…I only made it through the 1st few obstacles before I was in the wrong place and sent the purple puppy the wrong cue! I love that USDAA is embracing the challenges seen in Europe and giving those of us who what to challenge ourselves an opportunity to do so. These courses aren’t for everyone or every dog. My first dog, Noodle, would have absolutely hated this course. She liked the take what is in front of you non twisty turny courses. But of course she would do anything for me and her chicken. However, we must as trainers know what is best for our dogs. I would never enter Noodle in a Masters Challenge class if she weren’t retired…she isn’t the dog for that. My young dog, although doing well, isn’t ready either for these challenges either. Even though we’ve started the foundation work for these later in her career challenges, they aren’t ready for primetime yet. These “international” challenges are starting to pop up in American course design. I’m sure in the future a backside, threadle or other more technical handling challenge will be showing up more and more at our weekend shows. We all have and are becoming better trainers and handlers, so the sport will continue to evolve. We will start seeing more and more of those “crazy” designs from across the pond!